There is lots of buzz about the opportunity to leverage Big Data to drive business outcomes. However, some companies are struggling with a comprehensive strategy which includes taking a use case, and putting into production with a sound infrastructure strategy. One of the many challenges for clients include, “How do I stand up an infrastructure environment to support putting a Big Data use case into production at the right TCO with low risk to my business” (considering we could be talking about 100’s of TBs up to PBs of data). IDC recently predicted, in their recent paper “The Digital Universe of Opportunities: Rich Data and the Increasing Value of the Internet of Things” massive explosion of Data growth with 10x growth from 2013-2020. At the same time, they say only less than 5% of data today is actually analyzed to drive decisions and outcomes. They also say data from embedded Systems (signals from components of the Internet of Things) will grow from 2% in 2013 to 10% in 2020 which is part of the overall data growth, and represents an increase of being able to drive insight across various devices and products used from data being collected around the world. Energy: there are opportunities to leverage Big Data in Oil & Gas around Oil Field Automation, Risk management and in the Utility industry around preventative maintenance of energy stations and end user smart reader devices. Financial Services: there are use cases around trading & risk aggregation. Retail: there are use cases around customer sentiment, customer marketing programs, and brand loyalty. Telecommunications: there are use cases around customer retention and customer acquisition. Structured Data that lives in SAP systems include data about company transactions, customer data and product data. There can also be structured data sources that live outside SAP systems since many SAP clients have other transactional systems around their SAP implementation. These data sources may not be high “volume” however they are of high “value” to organizations. Unstructured Data sources may live within an SAP customer’s environment or outside in the public domain, and can include sensor data, machine data, meter data, and social data. These data sources are usually high “volume” but may not be of high “value” until analyzed in the right manner. One of the reasons for the large data growth taking place in the world is the billions of devices out there such as mobile devices and company products, which have the ability to send sensor data from them. This is where Cisco coined the term Internet of Things (IoT)representing how these “Smart Devices” operate and represent an opportunity. The most powerful use cases can come from combining and analyzing SAP data sources from transactions, customers and products with the unstructured data sources from sensors, meters and in the social space. A simple example would be a Telco provider pulling social data from the public data sources, and combining it with data about their existing clients in order to better understand when and how to provide better services. This can directly impact their ability to retain or gain clients. In order to achieve such a use case, often you have to collect 100s of TBs of Data. The way SAP looks to help clients with a Big Data strategy is with their “SAP HANA Data Platform” which encompasses the ability to effectively tier data across these data platforms, putting “Hot Data” in SAP HANA, “Warm Data” in SAP IQ (formerly Sybase IQ) and “Cold Data” in Hadoop to manage a large data set using a data temperature approach. SAP then provides intelligence of being able to move data between the data sources in changing business environments. For example, the data sitting in SAP HANA for Real-Time Analysis today may be different in a few months especially if a company were to acquire a new division or bring a new Product to market. At EMC we believe this is a sound Big Data strategy for an SAP client, however there can be challenges in making this strategy a reality; especially as it relates to the complexities of standing up various infrastructures, managing data protection and security as well as having a good overall data management strategy. These all represents challenges, and a potential higher overall TCO in a Big Data project, and are risks, which clients have to weigh in order to justify an initiative. To simplify the ability to execute an SAP Big Data strategy (assuming there is a justifiable Big Data use case) we have built an “EMC Big Data Platform for SAP” which we also refer to as the “Jupiter Platform” (the largest planet in our solar system…get it?! 🙂 ). This EMC Big Data Platform for SAP is a purpose built solution for the SAP HANA Data Platform’s strategy with all the compute, network, and storage needed to stand up a Big Data project. All virtualized infrastructure to drive cost out of the infrastructure (including the ability to run HANA Virtually). Think of it as an “Appliance” or “packaged solution” for Hot, Warm and Cold Data, which can scale enormously at the right TCO, given the platform can manage data through a data temperature framework. The platform also includes items such as management & orchestration, security and data protection (HA, Backup/Recovery and Disaster Tolerance). We believe this platform represents a much simpler way, which reduces risk for clients, taking a Big Data use case into production. With EMC’s 30+ years of experience in managing, storing, protecting and analyzing data, we have thought about all the infrastructure items clients need as they embark upon their Big Data Journey. Data Volume: The Big Data Platform for SAP can start in the 50 TB range, and scale to 10+ PBs with an optimized TCO in mind by moving most data to warm or cold sources at lower cost. Data Velocity: The Platform can ingest data at over 100 TBs per hour loading speeds so clients can make use of data captured before it possibly becomes obsolete. The Platform also enables fast analysis turnaround time for large data sets i.e “Fast Data”. Data Variety: The Platform can ingest any type of structured or unstructured data source such as sensor, files, email/SMS, social, multimedia etc. Data Value: Measured in a company’s ability to quickly find new business opportunities or ways to optimize such as a manufacturing process, logistics, or maintenance. The Platform reduces risks and gives predictable low $/TB by simplifying a Big Data deployment. Since the Platform also uses common tools and products, the required skillsets are likely to be the same that currently exist. Hence, the overall TCO of the platform is optimized so clients can focus on taking their Big Data use cases from “Concept to Business Outcomes” for their organizations. I look forward to talking more in detail about our SAP Big Data Platform at EMC World (May 5-8), SAP Sapphire (June 3-5), and at future SAP Week EBC events. Value trumps vendor Olympics for SAP HANA! I often ponder why clients, partners and internal EMCers often ask us what SAP HANA infrastructure (Appliances) we can provide for a said SAP HANA project. Many of us jump straight into the speeds and feeds of our SAP HANA appliance offerings: Cisco/EMC, VCE Vblock and most recently a TDI (Open HANA) with EMC VMAX. Clients and partners then want to immediately talk about how our appliances compare with alternative vendor appliances (“Vendor Appliance Olympics”). I thought the days of IT just providing technology infrastructure for a particular use case or project were over. I believe that SAP clients want to get business value out of their Projects such as an SAP HANA platform deployment. For most clients there has to be a clear plan with a business case in order to get justification and ability to initiate a deployment. Customers are also thinking about how to leverage the “Data” in order to further innovate and draw insights for their businesses. – how is the client looking to Deploy SAP HANA? – how is the client looking to Operationalize SAP HANA? – What is the client use case? As a Sidecar, an Agile Data Mart, BW, or Suite on HANA? – Who is driving this use case and business case for the client? SAP Consulting, SI or boutique BI shop? – Do you need to run a PoC to validate the use case and technology platform? If so, what metrics will be in place? – How is the client looking to migrate to HANA based on their use case? Starting with test/dev? – Does the HANA project fit into a larger Big Data or Analytics initiative? – Is the client looking to deploy HANA on-premise or off-premise? – If the client is looking to deploy SAP HANA on-premise, how is the client looking to deploy SAP HANA infrastructure: Appliance model, TDI or Virtual HANA? – How is the client looking to protect the SAP HANA environment? HA, Backup/Recovery, Disaster Tolerance? What’s the desired RTO/RPO? – Does the client want to manage the SAP HANA infrastructure, SAP HANA platform and/or functional use cases internally or are you looking for outside help to run the platform on-premise, in order to just take advantage of the business value of the SAP HANA platform? 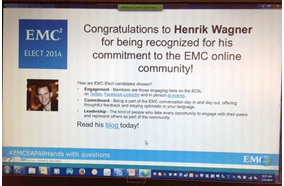 What I have found is that if you take this simple solutions approach, you will probably have a more intelligent conversation with your client about their project, gain credibility and will probably get an opportunity to tell a more strategic story on how EMC can help an SAP client be successful in their HANA project. EMC partners with SAP and SIs and boutique consulting firms deliver an end-to-end strategy on how a client can Deploy and Operationalize an SAP HANA platform in order to maximize business value, accelerate the deployment, reduce risk of the project and build out the right TCO model. With EMC partnerships, including our consulting partners and our Infrastructure partners: Cisco, VCE, VMware and Intel as well as our entire solutions portfolio including EMC Data Protection, I sincerely feel that we are in the best position to help our clients be successful in their SAP HANA projects with the most flexible and agile set of solutions. We also have a set of Service Provider Partners including HEC (HANA Enterprise Cloud) offerings for those clients looking to deploy SAP HANA off-premise. Another indvidual piece of the larger picture is to leverage EMC and VMware including Virtual HANA in HANA Deployment and Operations model. One way of engaging with us in this more intelligent way is at our SAP Week (#SAPWeek) events where we have our top SAP resources as well as the partners to help clients be successful in their SAP HANA projects. Here are two of those upcoming events in the Americas. Stay tuned for dates for EMEA and APJ. I am also looking forward to having this conversation with SAP executives at FKOM (SAPs Field Kickoff Meeting) in Singapore next week Jan 14th-15th and then at SAP FKOM Las Vegas Jan 21st-22nd. 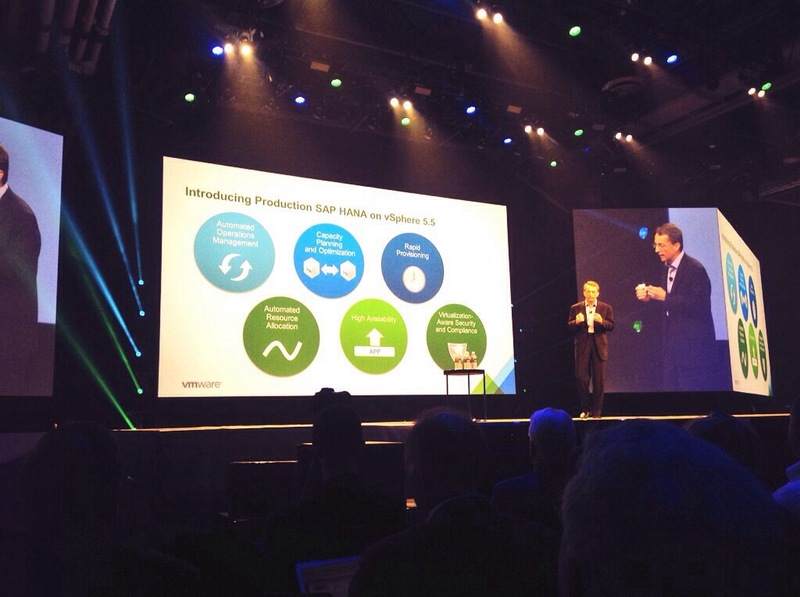 Want to virtualize SAP HANA with VMware? See what’s new! Exciting news. We are getting closer to a fully virtualized Hana (or vHana, how I call it, my mother calls it even my grandma calls it) support for production from SAP and VMware. Both companies announced back in June the availability of virtualized Hana (vHana) and the strategy and timeline for running vHana in production in various flavors, such on a supported hardware appliances like Cisco and VCE, TDI (tailored datacenter integration) or even on commoditized hardware. In case you haven’t heard, but EMC IT went live over a year ago with a fully virtualized SAP landscape, including app and database tier to reduce cost, minimize risk and increase flexibility. A couple of weeks ago, Mike Harding from EMC’s IT team discussed the Hana strategy and the plans to deploy vHana for production, another milestone in EMC’s journey to the cloud. Check out the replay of the webcast here. Virtualization is undoubtedly mainstream and more and more customers deploying even top tier business applications, such as SAP, on VMware, because virtualized SAP provides tremendous business advantages over classical physical SAP deployments. Advanced flexibility, agility and cost are just a few of these advantages. Imagine hardware maintenance without disruption and live migration of running vHana nodes even under heavy load to avoid a disaster strike. VMware just released a demo video to underline the power of virtualization for vHana by moving a busy, running vHana node from one ESX server to another within minutes. No expensive standby hardware, no business disruption and maintaining all SLAs. I am working on a more detailed blog on vHana to be released very soon with the full details on the various vHana deployment architectures and its advantages and why EMC is the number one storage and data management infrastructure for a truly, 100% virtualized Hana deployment. See you at TechEd next week! Having a ton of fun at EMC World 2013 in Las Vegas having great conversations with customers, partners and internal EMCers, many of which are “change agents” in the SAP Ecosystem and make an impact for all. Not only am I seeing how our SAP customers and partners looking for new ways to Transform, but also how EMC is stepping up to help customers truly “Lead Your Transformation” which is the theme of the conference! Had an opportunity to present our SAP Cloud & HANA strategy at the Global Partner Summit on Monday afternoon followed by conversations with those partners on their SAP business, which was very cool! I am now Inspired to head to SAP Sapphire next week in Orlando to continue my own Transformation journey as well as contuning contributing to the journey of our SAP ecosytem customers and partners!